Donald Quist is the author of the linked story collection, For Other Ghosts (Awst Press, 2018), and the book of essays, Harbors (Awst Press, 2016), which was a Foreword INDIES Bronze Winner and International Book Awards Finalist. His writing has appeared in The Rumpus, AGNI, and North American Review, among elsewhere. He is the creator of the online micro essay series Past Ten, and co-host of the Poet in Bangkok podcast. 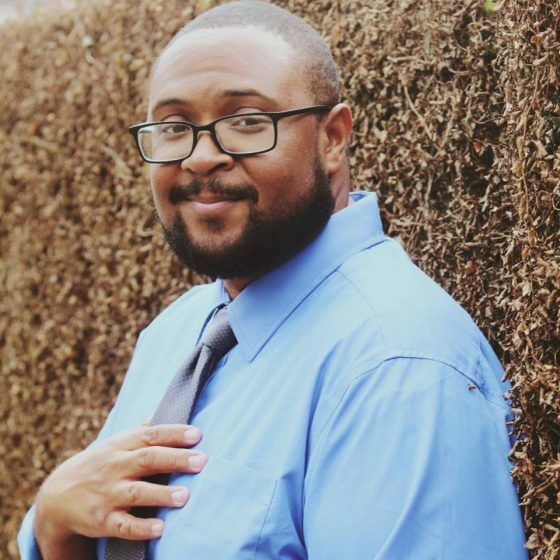 Quist is currently a Gus T. Ridgel fellow in the English PhD program at University of Missouri. Here, we talk about his latest collection, For Other Ghosts; about being human, both globally and individually; the constant need and desire to connect with others, and how we leave ghosts of ourselves everywhere we’ve been and with everyone we’ve encountered. 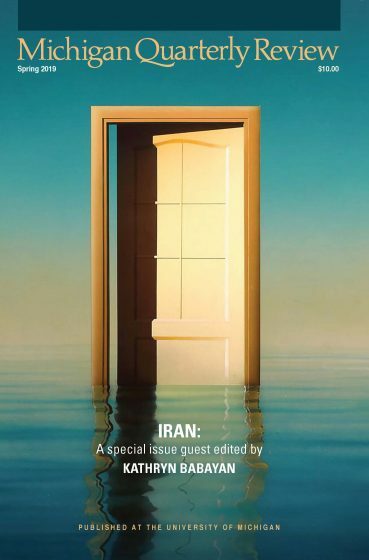 You’ve mentioned in other interviews that this collection is primarily concerned with globalization. Certainly, For Other Ghosts takes on a global scale, as the stories are set in Ghana, Hawai’i, Thailand, Japan, New England, New York City, and the World Wide Web, to name a few. How have your own travels influenced where you set your stories? I think travel broadens perspective. The act of going elsewhere forces one to interrogate customs and ideologies they may not know they carry. Every trip to a new place is an education. I understand that not everyone has the opportunity or resources to travel, especially to other countries. I recognize my privilege in having been able to visit different continents and live abroad for many years. I’m fortunate to have had a passport for as long as I can remember. Like the narrator in the first story in For Other Ghosts, my father is also from Ghana and immigrated to the USA. He would take me with him sometimes on flights home to Accra. This gave me a sense at a very early age that there was always more than what I knew growing up in Montgomery County, Maryland. I knew the world was bigger than my everyday experience as a middle-class African American. I knew there were cultures and identities in places I had yet to see; populations I had yet to imagine. And I knew that something connected me to those far off people and places. Through travel I have had the opportunity to reconcile the limits of my perception and develop an awareness for the ways in which my life connects with others vastly different than myself. This acknowledgment of limited perspective and recognition of links between otherness is at the heart of most everything I write, and is a thread throughout For Other Ghosts. When thinking about where to set each story, I considered places I’ve been as well as locations I’ve felt drawn to visit one day. I set many of the stories in places I have never been, prompting myself and the reader to see ourselves in someone, somewhere, unfamiliar. A theme that appears in almost every story in your collection is the need to prove oneself. Whether your characters are trying to prove their worth, their competence, their love, or their beliefs, they are constantly struggling to be recognized by their family, their partners, their society, their God, or even by themselves. While this struggle has been a part of human nature for eternity, how do you think globalization has amped up this anxiety? In the shadow of a world made smaller by technology and New Capitalism, it’s often harder to define the self. It’s harder to define aspects of a particular culture or social identity. As a result, it can be difficult, particularly for those from marginalized communities, to feel a sense of synchronicity with any one environment. Globalization pushes many to feel inadequate, myself included. While having more access and knowledge about what happens beyond one’s community is beneficial, it can also come with feelings of isolation and the tendency to not believe you’re doing enough compared to others from similar backgrounds. In every story, some element of globalization leads protagonists to wrestle with these feelings of inadequacy. In your story “Memorials,” political and personal fears collide. It’s an excellent account of the horror of 9/11 without giving any direct references. What I found fascinating was the way you depict the empathetic phenomenon where we see people on TV and feel an instant connection to strangers facing disaster. Why do you think that is? Do tragedies and hardships make people more real to us? I believe we are all connected. Those moments in which we experience and feel a deep sense of closeness with another person in pain far away, we’re tapping into what makes us essentially human. Disaster reminds us of the temporality of our mortal existence, the threat of loss. Tragedy and suffering are a real part of humanity, so I think most people find it a lot easier to empathize with those in turmoil, even if that turmoil is something we could never imagine facing ourselves. Most of us can recognize and understand the sense of loss threatening strangers in crisis. As one reads through For Other Ghosts, certain characters appear again and again. Namely, many converge in the experimental story, #COOKIEMONSTER. Characters from other stories leave comments in the online forum. Did you set out to include other characters in your universe? When I conceived the book, I knew I wanted to illustrate the interconnectedness of globalization, but I’m also very into world building. I like piecing together layered narratives. So, in the book, every character can be traced to another character if a reader takes the time to follow threads. Speaking of #COOKIEMONSTER, it’s a fictional crime story, literally “fake news,” told in all the written formats we get information on the world. The reporting on the sexual assault case is given to us through a collage of newspaper articles, tweets, personal opinion blogs, and comment boxes. The experimental format reminded me of the fake news article chapter in Jennifer Egan’s A Visit from the Goon Squad. Can you tell us about the inspiration behind the “collage of news stories” idea, and how did you make this collage a workable format for fiction? The format of “#COOKIEMONSTER” came about out of necessity. Form follows function. I wanted to convey how the Internet fails to capture the complexities of human trauma, how online communities lack nuance and can reinforce marginalization. So shaping the story in a series of search engine results felt most appropriate. The inspiration for the story came from “clickbait” articles and comments sections I’ve seen posted on social media. Sidenote: I love the forms Egan’s prose takes throughout that novel. So good! #COOKIEMONSTER is not the only experimental format in For Other Ghosts. Your ingenuity with form is so impressive! Within this collection, there are stories told in only questions, a fictionalized introduction to a fictional textbook, an email, etc. Do you typically know which form a story will take before you begin writing it? How do you get your inspiration? The format always comes from my intention for the piece. Once I know the core premise of a narrative and what I want it to convey—the aboutness of the story—the structure tends to reveal itself. I don’t usually think about form first, and I am wary of producing stories in which the narrative is less engaging than its appearance. I am often inspired by what I read, especially poetry. I see what other contemporary writers do and my desire to enter into a dialogue with the themes present in their work spurs me to try things I wouldn’t have originally. Were any of the stories especially easy or difficult to write? Are there certain characters in the collection that have inherited traits or elements of yourself? Continuing the discussion of “#COOKIEMONSTER,” this story was the most difficult to write. It took about four years to get it to a place I felt comfortable. Trying to balance the various voices and political stances, many in opposition to my own fundamental beliefs, it was a long struggle. Comparatively, “Preface to Tales of River,” a story written in the style of a preface to a fictional book, came together in less than two weeks. I’m a slow writer. A story feeling finished in less than a month is very rare. 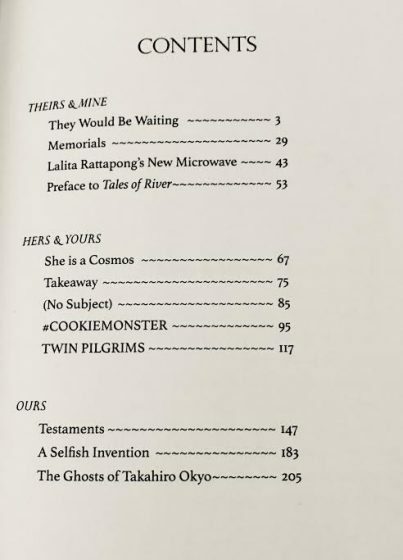 The only other story that was constructed less arduously was “A Selfish Invention,” because the frustrations the protagonist experiences as a person of color within an MFA program mirror many of my own. You skillfully write prose from the perspective of a Jewish wife in mourning, a queer woman of color, a Japanese “death god,” a religious Pakistani immigrant, and a young American boy with “Ghana in his veins,” among other characters. What a range! What helps you find the exact tone and voice for each of these unique, complex characters? Thank you! I’m never sure if I get the tone and voice exactly right. I guess I try to trust that the voice that comes to me instinctually is the best for the narrative—writer’s intuition. Music helps me when I’m developing the tone of a piece; the sounds aid me in shaping the work. I do a lot of research when working on characterization. As I said before, I’m a slow writer, and I think it helps the voices and tones mature. For many years, there has been a big discussion around Who is allowed to tell whose story? DaYana, the protagonist in your story “A Selfish Invention,” has this discussion, too. Her professor tells her that she should write “about her own people.” The conversation turns to issues of authenticity and reader expectations. How do you navigate these issues in your own writing? The collection is divided into three sections: “Theirs & Mine,” “Hers & Yours,” and “Ours.” How did those come about? What do they signify for you? My intention was to structure the book where it would lead the reader from first person to omniscient narration. This ideally reinforces the book’s underlying premise of moving past one’s own perspective, radical empathy. The first section guides the reader from “I” to “We,” the first person perspective becoming increasingly removed with each narrative. The second section pushes further, introducing a traditional third person followed by second person point of view “You.” The third, “Ours,” is all third person, the “I,” the self, is completely removed; the reader now seeing more widely beyond their own perspective. 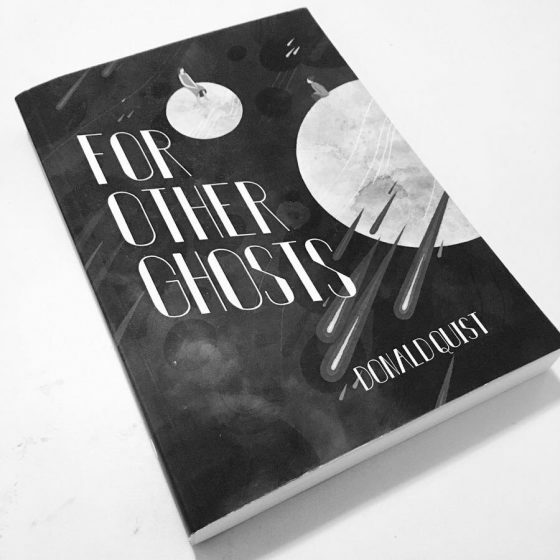 Finally, let’s chat about the title, “For Other Ghosts.” The line appears in the story, “A Selfish Invention.” DaYana tells her professor that if he is bored by writing for himself, maybe he should write “for other ghosts” instead. Do you think that you personally write for the ghosts from your past? If so, which ones? Yes! I wrote this book for those I’ve encountered who have been made to feel invisible. Each story in this collection can be traced to haunting souls, spirits of those I’ve seen trapped in flesh by institutions of oppression: a Chinese factory worker who showed me kindness on a trip through Zhuji; a group of disadvantaged women at a shelter where I taught in Thailand; a sick little girl I carried home to her mother in Teshie, Ghana; and so many others. I guess, in this sense, I’m also writing for the ghosts of my past selves. Find out more at donaldquist.com, or follow Quist on Instagram @donaldewquist.